Edna Cooper has rebooted her career four times during her 25+ year career. She has moved from Mental Health to the Travel Industry, Technology, Oil & Gas and back to Technology. As a Senior Technical Account Manager with Microsoft, she uses LinkedIn to learn about and stay in touch with current and future customers. She works closely with executives across multiple organizations, helping them use Microsoft Technologies to transform their business while staying secure. Edna volunteers through Microsoft Services Disaster Recovery to assist in times of need, including Hurricanes Harvey, Irma & Maria, a recent earthquake in Mexico City and the fires in Sonoma County. She has served as the President of Economic Development for the City of Roanoke Texas and on the Board of Directors for the Texas Women’s Energy Network. 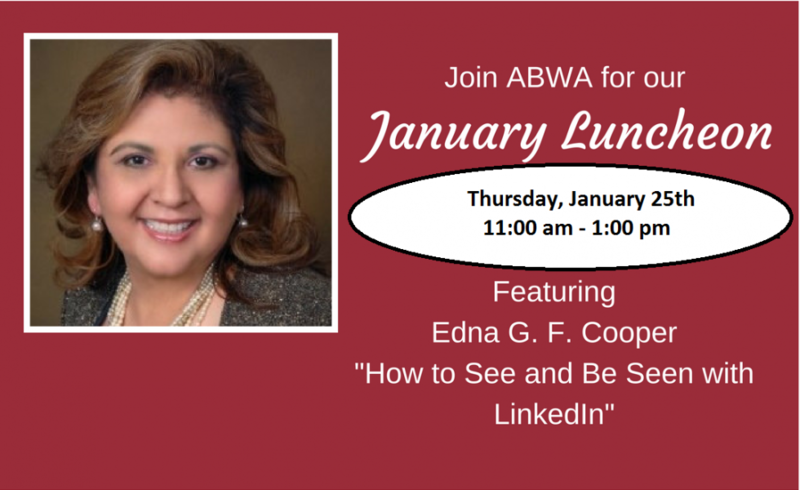 Edna has recently relocated to Louisiana and is excited to share her learnings on “How to See and Be Seen” using LinkedIn with the ABWA.